BRYAN EATON/Staff photo. 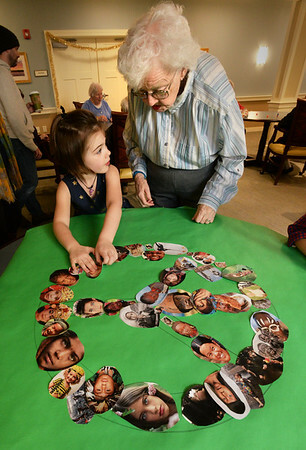 Youngsters from the Newburyport Montessori School met with residents of Avita Assisted Living and Memory in Newburyport to created a mosaic over a peace sign of photos of children from around the world on Wednesday afternoon. Resident Marianne Anderson watches as Julia Schulman, 5, of Newburyport places the photo that they glued. Afterwards the residents were treated to the children singing holiday songs with them.